The Cannon Inn and Brewery. If there is one building that has lived through many guises then this is it. Built around 1866 as a retail beer shop run by J Feest it was soon to become a brewery. In 1886 to great pomp and ceremony (a dancing bear and the Littlehampton brass band were employed) it opened up as the Cannon Brewery Museum and Assembly Rooms. Rebuilt in 1894 as the Cannon Inn. in 1934 it was listed as a dining room and closed in 1935. It was then purchased by the Worthing Gazette in 1949 and demolished in 1974. The Worthing Herald office now stands on the site. Apparently in 1894 the facade featured a terracotta cannon motive or casting, one wonders if that's resting in someone's back garden at the moment. It is interesting to note that the present modern Worthing Herald building is called Cannon House! 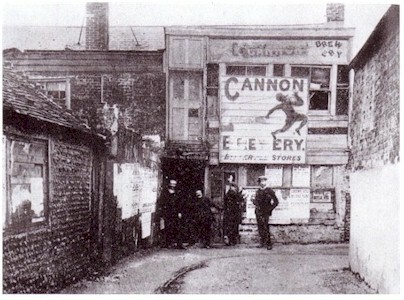 The picture below shows what might have been the back wall of the original building where it joined on the the back of the now demolished police station.